Today the CPUC and NRG released the finalized settlement of the decade-old legal battle over the 2000-1 California Energy Crisis, revealing details of the planned electric car charging station network to be built in California. In March NRG and the State of California announced a deal that both settles a decade-long legal wrangle stemming from the 2000-1 energy crisis, and also makes a bold move to create a huge network of electric car charging stations in California. Today NRG followed up by releasing the actual settlement filed by the CPUC with the Federal Energy Regulatory Commission (FERC) for approval. The details of the proposed EV charging network we published earlier were based on a preliminary document provided by NRG, and today we have available the finalized agreement (published on the CPUC website). The agreement stems from a period in California, during 2000 and 2001, where some energy companies abused a flawed deregulated electricity market in California, resulting in millions upon millions of dollars in excess electricity costs in California. Among those companies were certain subsidiaries of Dynegy, that were later bought by NRG, who then assumed legal responsibility. According to a statement by CPUC Commissioner Mark Ferron, "Dynegy together with NRG will have returned to the people of California more than $400 million in consideration" to atone for these acts. Of that amount, $300 million "will be paid in the form of cash to offset the electric bills of customers in California" and the remainder, more than $100 million, is the to-be-built charging station network infrastructure. The settlement breaks down into five major chunks: 1) $50.5 million to cover at a minimum 200 fast charging stations around California; 2) $40 million investment in electrical infrastructure that will support at least 10,000 level 2 charging stations; 3) $5 million for research and development of new EV charging services; 4) $4 million to support electric car based car sharing programs; 5) $20 million payment to the CPUC. 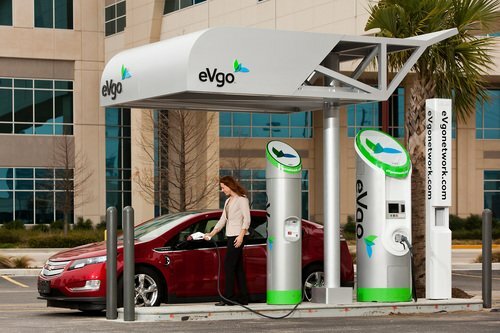 The fast charging stations will be owned by NRG's subsidiary eVgo. That company operates a charging station network in Texas today, and is preparing to expand into California. The fast charging stations are what eVgo calls a "Freedom Station" and consists of one DC Fast Charge station, at least one Level 2 charging station, and the wiring to add at least one or more fast charging and level 2 charging station at the same site. The fast charging stations will initially be compatible with the CHADEMO standard for DC Fast Charging, but as the SAE DC Fast Charge standard is finalized and becomes available in cars eVgo will make appropriate adjustments to the equipment. NRG expects to install 110 sites in the Los Angeles Basin, 55 in the San Francisco Bay Area, 15 in the San Joaquin Valley, and 20 in San Diego County. Completion of the stations will be spread over four years, with 20% in year 1, 30% in year 2, 30% in year 3, 20% in year 4. The company could end up building more than the 200 Freedom Stations, if the cost to build stations drops and NRG ends up having not spent $50.5 million. The stations will be distributed every 5-10 miles, in major metropolitan areas, open on a 24/7 schedule, and located in retail areas near major highways. A portion, 20%, will be installed in areas of low- to moderate- income households. This is meant to ensure access to charging stations by those less well off, and plays well with another provision of the agreement, the $4 million amount allocated in part to support EV Car Sharing programs. NRG and eVgo is not going into the car sharing business themselves. Instead eVgo is working with car sharing programs to ensure electric cars owned by the car sharing programs have access to the Freedom Stations. One goal is to increase car sharing program presence in low- to moderate- income areas, and to make electric cars more available to those of "all socioeconomic backgrounds" in part by offering EV Car Sharing and EV charging stations in low- to moderate- income areas of California. In Texas, eVgo's network of Freedom Stations is only available to card carrying eVgo members. In California, however, the stations will be accessible to anybody on an "open" basis. Electric car owners will be able to drive up, provide a credit card, and pay on the spot to charge their car. The cost in this case will range between $7 to $15, and provide "50 miles of charging, in 15 minutes". Customers can become eVgo members, pay a monthly membership fee, and get a level of service that is yet to be announced. The next part of the network is the 10,000 level 2 charging station locations, which the settlement calls "Make Readies". There will be at least 1,000 "Make Ready" sites supporting the wiring for at least 10,000 level 2 charging stations. NRG's responsibility for these sites is installing the wiring necessary to install level 2 charging stations. Ownership of the Make Ready sites will be turned over to property owners where the sites are installed. NRG will have an 18 month period, after installation of a given Make Ready site, in which eVgo has the exclusive right to install level 2 charging stations. After the 18 month period eVgo competitors will have access to install charging stations. In an effort to "future-proof" the Make Ready sites, each will have a 30 amp capacity. This is enough to support electric cars with a 6.6 kilowatt charge rate, such as the Ford Focus Electric, the Coda electric sedan, and the 2013 or later Nissan Leaf. The Make Ready sites will be 35% for "multi-family housing" (apartments), 15% for workplaces, 10% for public interest sites, and the remaining 40% at the discretion of NRG at multi-family housing, workplaces or public interest sites. This means eVgo will be concentrating on apartment or condominium complexes and workplaces, leaving many other potential charging station locations open to eVgo's competitors. NRG will be required to give ample opportunity to hire local workers and local contractors, and hiring women- and minority- owned businesses in constructing both the Freedom Stations and Make Ready sites. The agreement covers several smaller items circling around research and development of new charging station technology, support for EV car sharing programs, and programs to train EV charging station installers. The "technology demonstration programs" may include projects such as a) stationary grid energy storage systems to support DC Fast Charging stations and reduce peak electricity demand, b) higher power DC Fast Charging stations exceeding 80 kilowatts charging rate, and c) smart grid and vehicle-to-grid demonstrations. NRG will also be collecting utilization data of the Freedom Stations and Make Ready sites, collating the data into quarterly reports to be shared with the CPUC, California research institutions and appropriate non-governmental agencies, such as the California Independent System Operator Corporation. The point of this is to help the powers that be understand the electrical grid demands that will come from increased electric vehicle adoption. The data will be anonymized and summarized to prevent its use in big-brother-like scenarios. The regulators are concerned about aggregate totals of electrical use, not whether John Smith drove his car to the neighborhood Walgreens at 2AM to charge up. This agreement provides eVgo with a huge entry into what's expected to be the largest electric vehicle market in the world, California. It also has the potential to be a watershed moment for electric vehicle adoption, with a massive increase in electric vehicle charging station infrastructure. Distributing fast charging stations around Tokyo in 2008 made for a large jump in electric vehicle utilization. There is every reason to expect the same will happen in California. However, whether this deal will squeeze out competing charging station networks remains to be seen. Excellent summary! I like most of the deal, it is providing something that we EV drivers need but entities have been reluctant to provide due to uncertainty. EVO is being forced to take a risk and if the business model fails, the wiring will remain. So consumers win in that aspect. The current pricing plans EVGO has will work for me @ $89 covering my home electrical use as well as all of their network. Ecotality is a non-performing contractor and has earned no voice in the discussion. Excellent summary! I like most of the deal, it is providing something that we EV drivers need but entities have been reluctant to provide due to uncertainty. EVO is being forced to take a risk and if the business model fails, the wiring will remain. So consumers win in that aspect. The current pricing plans EVGO has will work for me @ $89 covering my home electrical use as well as all of their network. Ecotality is a non-performing contractor even though they have the biggest advantage. What a BAD deal for the EV community and residents of CA. This will create a scenario where two companies, NRG and Coulomb (who will supply the back-end technology to EVgo), will be given another gift from government to further control the market place. This is keeping costs to the consumer up because better, more cost competitive products and business models can't come to the market because subsidies and back-door deals are suppressing them with an uneven and unfair playing field. Once these two companies get control, it will be impossible for real competition to take hold and bring prices down. This will be a death blow to the long term outlook of the EV community. As a citizen of CA I am disgusted that the CPUC would take a $900M fraud claim against a company that ripped off CA citizens and lower the damages to $120m. And then allow the perpetrator of the accused fraud scheme to simply pay $100M of the penalty to itself. How many backdoor dinners and discussions and whatever else did it take to get this sweetheart deal done. I'm sure a lot of companies would pay $100m to ensure they lock up the California market for the next generation of vehicles if they new the CPUC and governors office where going to safeguard their investment.